Introduction: No other medieval weapon shares the flexibility, power, and aloof mystery of the poleaxe. It can be, as Fiore dei Liberi termed it, “ponderous, cruel and mortal.” “Ponderous” in that it is a relatively heavy weapon than the more elegant longsword, yet one that could–unlike the longsword–pierce armour of plate. It can smash, cut, pry, pierce, tear, rend, hook, lever and press. 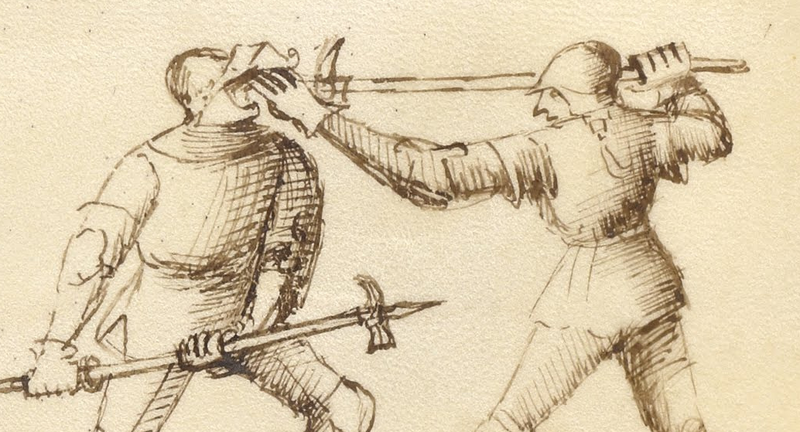 As the anonymous author of the Jeu so eloquently states, the use of the sword, dagger, light lance (spear), and single-handed sword may all be learned through the use of the medieval poleaxe. Dei Liberi also termed the hache “cruel,” an epithet it earns with the potential for destruction evident in its design. Indeed, the axe seems refined for intimidation—much like a modern ‘assault’ rifle, a fact that could account in part for its popularity within the judicial combats in Germany and Burgundy during the 15th century. In a fight with axes, the initiative moves with great rapidity between the combatants; a back and forth flow to the fight that is different than a comparable fight with longswords. Fate can indeed be seen to be cruel when what appears to be a valid and relatively safe attack is suddenly turned as the opponent seizes the initiative by displacing and countering with the deadly queue. Indeed, the streitaxst seems designed to reinforce the old idea of medieval fighting codified in fencing and martial arts literature by Edgerton Castle in the 19th century as “rough and tutored.” Although many fencing historians have perpetuated this view even in recent years, there is a growing body of literature built upon an exciting corpus of medieval and Renaissance fighting techniques that should overturn the antiquated view of medieval soldiers unsophisticatedly bashing upon one another without regard to the martial realities. Indeed, with more than 175 fighting treatises surfacing and slowly being studied, published and reconstructed, the next several decades promise to be an exciting time for medieval and Renaissance martial studies.